Fast, efficient, profession­al service from a super speedy transcript­ion team with extensive interview transcribi­ng experience­. Typing! If it needs typing we can do it. Digital, copy typing, data entry. Freelanc­e / contract / overflow. 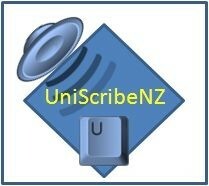 Uniscrib­eNZ, the only typist you need. Based in Hamilton, New Zealand - Worldwide service available. You talk, We type = Easy! Typing – it’s what we do, it’s all we do so if you need typing done then you should talk to us. Exceptional service from New Zealand professionals. Accurate,fast and efficient contract transcription and typing service. High volume, fast turnaround available. We type anything and everything, any time. Interviews - research, investigative, focus groups, available in NVivo-ready format; property inventory reports with an overnight service available for overseas clients. All enquiries welcome. Call, text or email UniScribeNZ today to see how we can help. Happy to provide obligation free quote. NB: I respond to all enquiries. Sometimes replies end up in spam/junk folders, if you do not receive a reply to your enquiry please check spam/junk folder. Out standing service thank you. Your communication, speed and quality of work, coupled up with the great value for money is second to none. Thanks Jude for making this easy for me, i could not have done it without your wonderful services. Fantastic service - fast and professional. Jude's service is outstanding. She has assisted me with a number of reports, often under tight timeframes, and has done so to a high standard and always ahead of schedule. Her accuracy is excellent and her services provided at a grrat price as well. Highly recommended and you won't be disappointed. Jude Ryks: Thank you Justine, I always enjoy your work. I have used Jude now for two research transcript work assignments and her work has been completed to a very high degree of accuracy and fast turnaround times, I would not hesitate to employ her again as her work ethic is exemplorary. Jude Ryks: Thank you for your feedback. The work has been enjoyable and I look forward to working with you again.